L-R: Amanda Gent, Finance Director, Cullum; Mark Jansen, Managing Director, Cullum; Claudio Davanzo, Creative Director, Purpose Media; Mark George, Sales & Business Development Director, Cullum. Cullum Detuners based in Heanor, was originally founded in London to supply specialist acoustics to the building trade. Their growing expertise in acoustics and the noise generated by aircraft engines led to their appointment to design a silencer for a jet engine developed by Sir Frank Whittle. 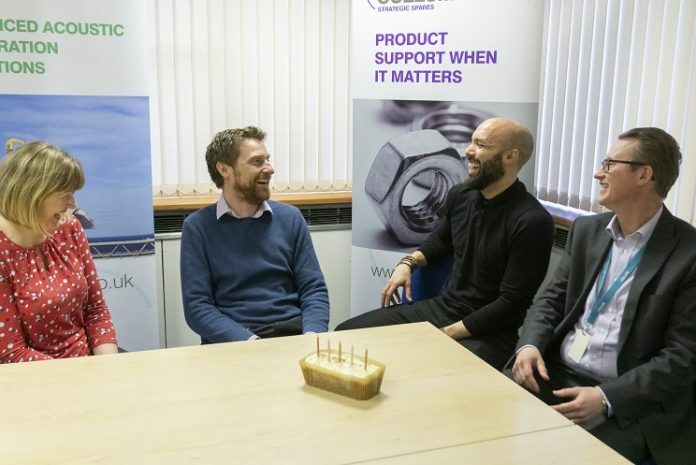 In order to capitalise on the growth in the aerospace industry, Cullum Detuners was formed on 21 April 1959 and the company moved to its current site in Heanor in 1972. Cullum is now a leading supplier of noise control enclosures, acoustic filtration and exhaust systems to the aerospace, energy, marine and nuclear industries. Purpose Media, which is based in South Normanton, has been appointed to help Cullum revise its marketing strategy and to develop a communications programme to launch the new brand identity and market positioning. Commenting Mark Jansen, Managing Director of Cullum said: “As a customer focused business we are trusted to deliver engineering solutions from concept to installation and have many global contracts. Claudio Davanzo, Creative Director from Purpose Media added: “We met with the management team to get under the skin of the company and really understand its values. We then combined this with our knowledge of working with owner managed businesses in the manufacturing and engineering sectors to create design solutions that more fully reflect the innovation and engineering excellence that Cullum deliver. Cullum currently employs over 160 staff and for the financial year ending March 2018, reported turnover of £30 million, an increase of £4m from 2017.